Brooks is a journalist, author and lecturer. She has won many awards for her writings -- books and print articles, most notibly over 1,000 in the New York Times. In 2012 she won First Place in the Simon Rockower Awards for feature writing (magazines). In November 2013 she was honored by the Connecticut Women's Hall of Fame for her lifetime achievements. A romantic thriller with a political twist! "Russian Dance is Jewish history like you have never read it before. First Place winner, National Federation of Press Women, 2005 for biography/history. Purchase or download a copy of this book from its (amazon.com) dedicated web page. Click here on the title. NOTE: We continue to mark the 500th anniversary of the birth of Dona Gracia Nasi and we now have a traveling (portable) exhibit to accompany a program. Contact the author for details. You can also join our community and see research updates by clicking on the following Facebook link: DonaGraciaWorldwide. "The Secret Jews of Calabria,"
Hilton Hotel, Denver Tech Center, Denver, Co.
mini courses are regularly available. book group discussions of her works. arranged using a Skype video-hook up. See "Book Groups" page for details. (more details and a full list of topics can be found on the "Lecture Topics" page). 1. Jews and the American Civil War. Contrary to popular belief, Jews were deeply involved. Why were they eager to join up? What was their attitude towards slavery? What was the real story of Judah P. Benjamin, often described as the "brains behind the Confederacy." 2. Ghetto, Emancipation, Immigration: the story of the German Jews; their background in Europe and why their experience coming to America was so different from the later Eastern European Jews. 3. The Jews of India: from Solomon to Sassoon and beyond: Jews have been trading and settling in India since biblical times. We look at the various migrations and how they maintained their communities for almost three thousand years. 4. On the Fabled Road to Samarkand: a look at the Jews of the ancient Silk Road and later times (known as Bukharian Jews); based upon a trip taken by the lecturer to Uzbekistan in the fall of 2013. 5. Food in the History of the Jews: a tour through the evolution of of Jewish Food from biblical times to today. 6. From Blood Libel to Balfour Declaration: the remarkable history of the Jews of England. 7. The centuries-old history and culture of the Jews of Iran/Persia. 8. Exploring Cuba: its once and future Jews.A look at the way Cuban Jews are increasingly coming out of the religious closet; based upon a recent visit by Brooks to the island. 9. A Woman for the Ages. The unlikely tale of Amelia Bassano: the shadowy Jewish woman behind Shakespeare and his canon. And how it might change our traditional image of Shylock and the original goal of "The Merchant of Venice." 10. The origins and lesser-known history of the Jews of Russia: understanding their true role in the Bolshevik Revolution. Includes research compiled for her book "Russian Dance." Included is the story of the Jews and the McCarthy era here in the United States. 11. 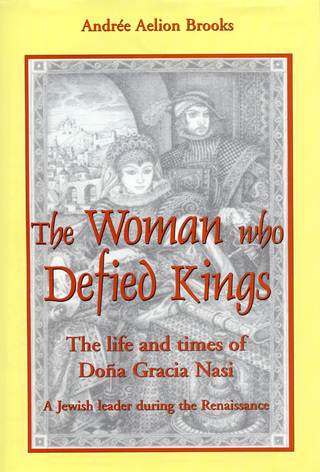 The Incredible story of Doña Gracia Nasi: a 16th century Jewish woman banker and leader. Includes back story of how documents were found. 12. The Origins of Jewish Life in Europe and the birth of Ashkenaz. 13. The Ancient Origins of Merchant Jews and their impact upon our history. Also taught as a mini course: "On the Road with Jewish Merchants." 14. The Jews in the Renaissance: the background, personalities and their artistic achievements. Why we rarely hear about them. Also taught as a mini course. resonates even today. Also taught as a mini course. 16. Were there really Jewish Pirates of the Caribbean? Background and understanding. 17. The (real) history of the Jewish doctor. 18. How DNA studies and genealogical research is affecting our understanding of Jewish history and ourselves. 19. Magic, merchants and miracles: the 2,000-year history of the Jews of Morocco. 20. The hidden history of the Jews of China. 21, The French Connection: Jewish life in France through the ages. 22. Our Past, Ourselves. The real story of the early 20th century mass Jewish immigration into America and their impact upon our attitudes today. 23. Jewish Women through the ages: five-part mini course looks at women from ancient Alexandria through to the revolutionaries of the early 20th centuries. 24. Bad Boy of the Jewish World: a new look at the life of Baruch Spinoza, the excommunicated Dutch philosopher. 27. Workshop for teachers in Hebrew/Jewish Day Schools. Not to be overlooked: our multi-media curriculum for children called "Out of Spain" which traces the history, culture, music, festivals and food of the Jews who lived in Spain for 1500 years and more; including where they went after the expulsion and why. This workshop helps familiarize teachers with the materials and how to use them. 28. ... and for all teachers, school counselors, parents and grandparents: Raising the Over-Privileged Child; based upon her award-winning book/workbooks "Children of Fast Track Parents," recently updated and offered as an e-book. A one-hour Emmy-nominated documentary, based upon the research, is also available from amazon.com. Ask author for details. LEARN MORE ABOUT EACH BOOK? "Russian Dance: a true story of Intrigue and Passion in Stalinist Moscow"
"The Woman who Defied Kings: the life and times of Doña Gracia Nasi"
"Children of Fast Track Parents"
"An excellent child-rearing guide," New York Times; available with hands-on workbooks. New! e-book edition and a companion documentary available on amazon.com; workbooks directly from this author.